A major work from Jafar Panahi screens in competition at the Berlin Film Festival as again the Iranian director challenges the ban on filmmaking set on him by the regime’s authorities. 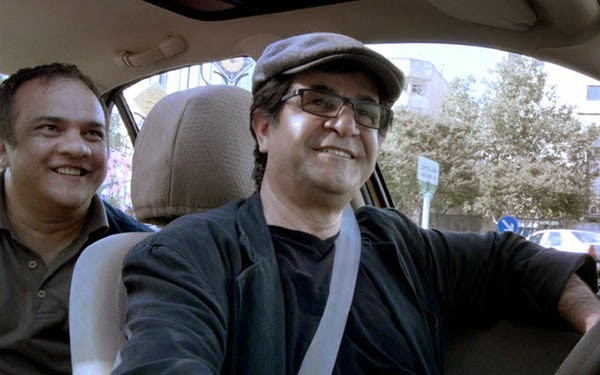 Taxi (2015) is the director’s third film since, and it’s brighter and funnier than his moody This is Not a Film (2011), breezing along as it does through the streets of Tehran with Panahi disguised – not too well it must be said – as an on-the-beat cab driver. Its heart beats to a complex rhythm in which, unable to officially direct (the film comes without credits), Panahi films documentary-style with a camera strapped to his dashboard, shipping various members of Tehran’s community across town. He’s a cheeky presence, smiling wryly, barely knowing his way around the city. He picks up teachers and old women going about their business, but also dissidents and in one scene an injured and bloodied man. This being Panahi, could he be a protester? But Taxi isn’t that abrupt. Instead he’s a victim of a motorcycle crash, who’s more hypochondriac than medical emergency. Most disarming about Panahi’s viewpoint is how deftly he succeeds in shifting gears from light comedy to serious national issues. One conversation with a lawyer – like the filmmaker, banned from her profession – goes from family small-talk to hunger strikes. It’s part of the director’s self-aware confidence that the hunger striker is a woman who tried to go to a volleyball game – imitating the plot of his 2006 film Offside. Indeed the taxi itself is a reference to Abbas Kiarostami’s Ten (2002) which is set entirely inside a cab and was featured recently in Rakhshan Bani-Etemad’s Tales (2014). That freewheeling spirit grips the film. When a pirate DVD salesman hops into the car, the director offers a knowing smile when he’s recognised. Wishing to justify his profession, the pirate asks “how else can students see foreign movies?” Last time they met, Panahi rented Midnight in Paris (2011) – what an unnatural thing to imagine him watching that. Sure, it’s contrived, but Panahi’s gaze is unobtrusive, its profundity accidental. Here is the director stuck in a taxi (not house arrest, as previously), a claustrophobic space perhaps, and yet the film is visually lively, the conceit brilliantly made out. At 82 minutes, this is a brisk but hugely powerful work that is cinema of the oppressed par excellence. The conclusion comes when he picks up his niece from school, when it’s established she has to make a “distributable” film for a school project. It’s one in which the heroes have to have names of Islamic saints, where women where headscarves and which can’t show any “sordid realism”. It’s a ridiculous set up (how many Tehrani schoolkids would have cameras?) but Panahi’s blabbermouth wannabe filmmaker relation is an energising presence. According to her teacher, the film “can be real” but not “real real”. So when she films a kid pick up money dropped by a passer by, she tells him to give it back so she can use it in her film. It’s a clever proposition about the nature of film directing – it controls, it contrives, as much as it documents. Of course, that’s not what real life is like; he can’t give it back, so she can’t use her film. That’s all that Iran allows. But it’s not just referencing Panahi’s situation. Not acknowledging – indeed not recording – reality as it is for people is how oppressive regimes thrive. “We have to get to the root of the problem” poses one passenger early in the film. As raised by all of Panahi’s work, that root is just what is so difficult to change. Never is the panoply of Tehran culture more succinctly put than in this masterful film. The Berlin Film Festival takes place from 5-15 February. For more coverage follow this link.